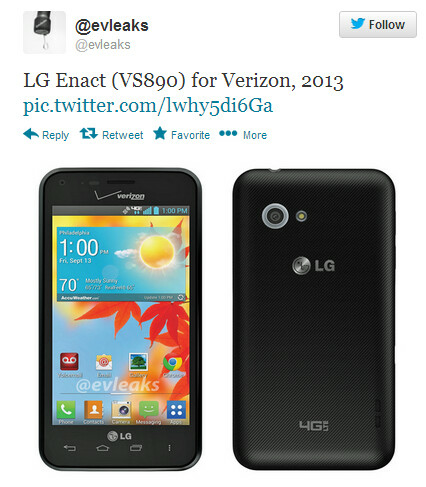 A tweet from evleaks revealed on Saturday, a render of a new mid-range device heading to Verizon known as the LG Enact. This device, to be known as the VS890, will apparently come to market already loaded with Android 4.1 (see the Chrome icon on the screen?) which means it will include Project Butter for smooth as silk scrolling (the only hiccups will come from your drunk uncle). Google Now brings you the information you need, when you need it. And actionable notifications allow you to view pictures or videos, and respond to emails directly from the notifications shade. The LG Enact will feature 4G LTE connectivity and while no pricing or availability was noted along with the picture, this model is expected to join Big Red's lineup later this year at a subsidized price that won't make you cry out in pain. Sure, LG has its eagerly awaited LG G2 to unveil on August 7th, but man does not live on high-end models alone. UPDATE: The buzz around the water cooler is that the LG Enact will sport a display with resolution of 480 x 800 and a Qualcomm Snapdragon S4 Plus or a Snapdragon 400 under the hood. This is based on the Adreno 305 GPU on board. "the only hiccups will come from your drunk uncle" Lol.. 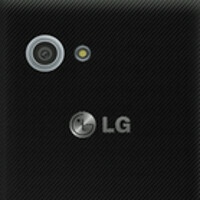 I like that one.. calling android laggy is definitely getting old... Time to move on by the way decent device lg. Let's make phonearena a more friendly and helpful community. This is off topic but please help. Are those dual sim phones like "LG L7 Series II Dual" dual active? I mean can I use mobile data with the other sim and receive calls or even just SMS with the other sim at the same time? If that's the case then hopefully this phone will have the same or higher battery capacity than the Lucid 2 which was released not too long ago and is an entry level phone (though with moderately high specs). It would serve as a nice back-up smartphone.